To understand microscope to observe cellular components. 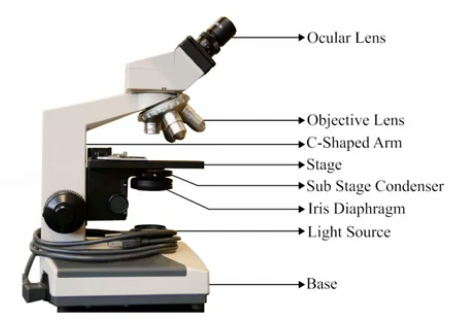 Microscope is an optical instrument that uses lens or combination of lens to produce magnified images that are too small to seen by unaided eye. The purpose of a microscope is to magnify and thereby study an object or organisms which are too small to be seen by naked eye. Anton Van Leeuwenhoek, a fabric merchant of Holland was first invented the microscopy and so known as ‘Father of microscopy’. It is necessary to understand the way in which the lenses bend and light focusing to know how a light microscope works. Usually all modern microscopes are compound microscopes in which the magnified image formed by the objective lens is again enlarged by additional lenses with different magnification. It is commonly used in laboratories for scientific research. Objective is the most important part of microscope which will produce a clear image rather than a magnified one. Resolution is an important factor for the functioning of objective. Resolution is the capacity of a lens to distinguish between small objects which are close together. The working of microscope starts, when direct or undeviated light from a specimen is projected by the objective. Then it spreads evenly across the entire image plane at the diaphragm of the eyepiece. The light diffracted by the specimen is brought to focus at various localized sites on the same image plane, and there the diffracted light causes destructive interference. A consequence is the reduction in light intensity resulting in more or less dark areas. These patterns of light and dark are what we recognize as an image of the specimen. Since our eyes are sensitive to variations in brightness, the image then becomes a more or less faithful reconstitution of the original specimen. The objective lens at first forms a real inverted magnified image. Eye piece further magnifies this image. So a virtual magnified image is formed. In this chapter we are making user to control a light microscope remotely using a eukaryotic cell. A cell is the structural and functional unit of life. Every organism composed of one or more cells. All cells are categorized in to two groups- Prokaryotic and Eukaryotic. Most complex cells are eukaryotic with a true nucleus which is enveloped by a membrane. Presence of this nucleus gives their name as eukaryotic which is taken from Greek. Eukaryotic cells contain a variety of cellular bodies termed as organelles. These organelles functions in the cellular activities and metabolic functions. Eukaryotic cells contain membrane bound organelles are ribosome, mitochondria, endoplasmic reticulum, Golgi apparatus etc. whereas prokaryotic cells lack a true nucleus and membrane bound organelles. Microscope is used extensively in cell biology, microbiology, biotechnology, microelectronics, nanophysics, pharmacology, mineralogy, and forensics. It is also used for medical diagnosis particularly while dealing with tissues or in smear tests on free cells or tissue fragments. Advances in microscopic techniques enable the visualization of a broad range of biological processes and features in cell structure. Carry the microscope by holding the C-shaped arm with one hand and other hand under the base. Never swing the microscope while carrying. Never allow direct light to fall on the microscope. Cover the microscope with a plastic cover when not in use. While using oil immersion objective, do not adjust the coarse screw. Oil immersion objective should be cleaned after use by wiping with soft cotton cloth or lens paper. Dry objective should never come in contact with oil. At the end of every experiment, clean the lenses with lens paper. The scanning objective or the 4x objective should be locked in place in the revolving nose piece, the stage should be centered and objectives should be rolled up away from the stage, when the microscope is replaced after use. When the microscope is replaced in the cabin .the microscope's arm/pillar must face the opening of the cabin.